As regular readers will doubtless be painfully aware, this column shares Warren Buffett’s view that the best time to start researching – or even buying – an asset is when no-one else is. Anyone who sympathises with that contrarian take on markets and asset allocation might therefore be thinking about gold, not least because no-one else seems to be. In August the metal dipped below $1,200 and reached its lowest level since January 2017. This slide may seem all the more surprising to some advisers and clients given its status as a perceived haven in times of strife. 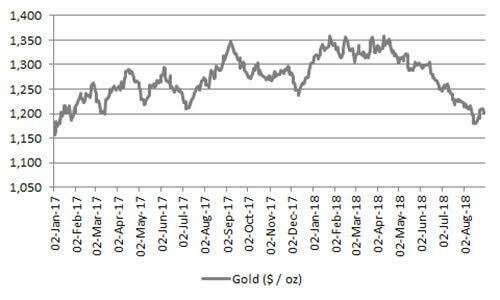 It would have been logical to expect the gathering crises in Turkey and Argentina, for example, to take gold higher but nothing of the sort has happened. This may be because markets are still of the view that Turkey and Argentina represent a little local difficulty but nothing more and certainly nothing with the power to roil markets on a global basis. Such complacency proved ill-founded when it came to a devaluation of the Thai baht in 1997 and a downturn in the Florida property market in 2007 and only time will tell this time around. But, besides faith in the global economic outlook, there is an even more powerful force that is working against gold (oddly, just as it is against Turkey and emerging markets more generally). That is the dollar. Like most raw materials gold is priced in dollars, so if the greenback goes up then the precious metal becomes more expensive to buy in local-currency terms, potentially dampening demand (or so the theory goes). 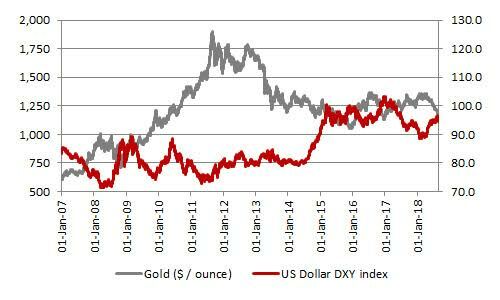 Financial market participants’ awareness of this historic relationship means they could also look to ride dollar strength by shorting gold, selling it now to try and buy it back later at a lower price and pocket the difference as a profit. It is possible to track short positions in gold via futures contracts on America’s COMEX, for both commercial and non-commercial interests. Each futures contract represents 100 ounces of gold. Commercial traders are likely to be gold miners or consumers of the metal such as jewellers who may use futures contracts to hedge their exposure or lock in prices at a certain level, but non-commercial traders are financial market speculators. What is interesting here is that non-commercial short gold futures contracts have surged from 73,905 in June to 222,210, a figure which is more than double the amount of bearish positions on gold a year ago and the highest going back at least 20 years. The implication is that bears are clearly stomping on gold, with dollar strength as the most likely pretext for doing so. Contrarian advisers and clients may be intrigued to note that short futures positions against gold have surged by more than 100% year-on-year on several occasions since 2010. Gold subsequently rallied on almost every occasion, although it must be acknowledged that 2013 was a notable exception. Fans of gold will therefore be arguing that all of the bears have piled in, given the huge number of short positions, leaving gold ripe for a snapback if the sceptics are put to flight. The question is what could be the trigger for that? One possibility is central bank policy, because of its impact on the dollar. The US currency is gaining as the US Federal Reserve reduces its Quantitative Easing programme and markets prepare themselves to be further deprived of liquidity by an end to increased QE from the European Central Bank. The Bank of England has already stopped adding to QE, leaving just the Swiss National Bank and the Bank of Japan to create money out of thin air. 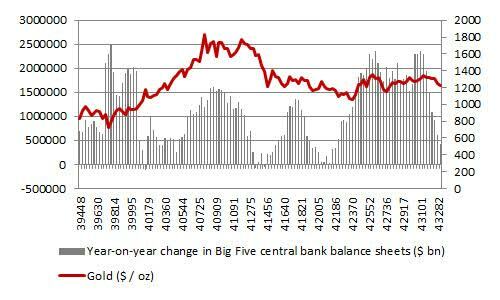 Gold has done well when central banks have been adding to QE (amid fears the monetary authority have lost control of the global economy) and badly when they have not (in the view that the central banker have everything in hand and there is no need to create more ‘money’). In sum, gold may well thrive if central banks, for any reason, find themselves obliged to stop raising interest rates, or start cutting them, or – most dramatically – crank up the electronic printing presses and turn to QE once more. That may seem outlandish right now. But an expansion in the aggregate assets of the British, EU, American, Swiss and Japanese central banks from $3.5 trillion to $15 trillion from 2007 to 2018 would have seemed like science fiction a decade ago and the Fed moved to bail out the Long Term Capital Management hedge fund at a cost of $3.6 billion in 1998 after the Asia and Russian debt crisis. Who knows, Turkey’s crisis could still have wider implications than we dare imagine, to the benefit of gold and gold miners, while a surge in global indebtedness since 2007 could still oblige central banks to return to record-low interest rates and QE if – and when – the next global downturn comes.